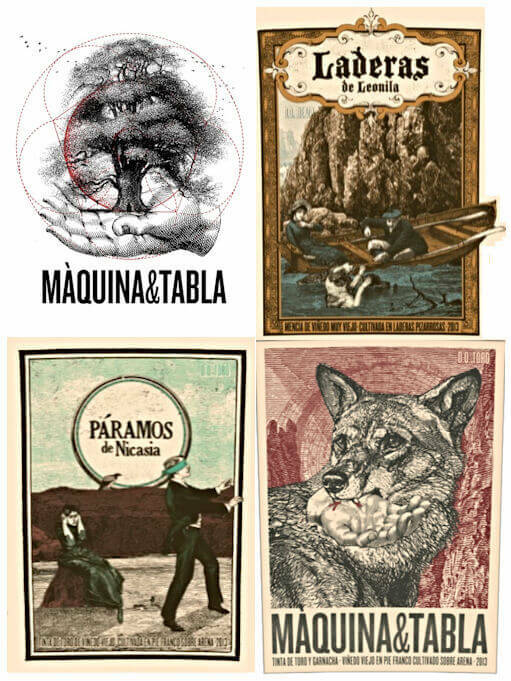 MAQUINA & TABLA are Oriol & Susana Illa who own and operate this extraordinary tiny wine business. All grapes are farmed biodynamically from small plots rented across northern Spain. The wines have attracted much attention for the extraordinary labels but mostly for the extraordinary wines. From traditional Spanish varieties like Tinta de Toro (Tempranillo) and Garnacha, or less mainstream varieties like Mencia, Verdejo and Palomino, Oriol and Susana have crafted some delightful and pure, small-scale expressions of the land they farm. Jancis Robinson MW praised their work fulsomely after tasting the wines and meeting the makers at our Autumn tasting last year, making the Laderas de Leonila Blanco her Wine of the Week. Here's your chance to sample a selection from their range - two bottles each of three reds, two whites and their rather charming clarete rosé.